Deformed and hated. A stranger in the land. Can she find inner strength and self-confidence? Zehira’s deformity makes her a mocked and tortured outcast. Beaten and left for dead, she fights to save herself and her children. Finally arriving as unknown newcomers in the city of Zion, she struggles to overcome her past to make a new life for herself and her family. Though married to Enoch, the founder of the city, she conceals her identity, seeking acceptance based on her abilities and talents, not on the acclaim of her husband. Moving into Light: Zehira, Wife of Enoch, Book Four in the Ancient Matriarch series, is an inspiring book of ancient fiction, capturing a spirit of hope through unrelenting trials and confirms the power of faith. This rich historical fiction imagines a story of a lost period. If you like feminine perspectives in illuminating stories of women of faith and courage, you will like this book. 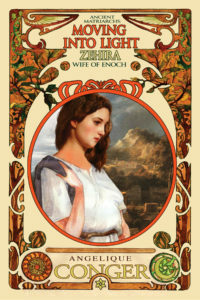 Purchase Ancient Matriarchs Book Four, Moving into Light: Zehira, wife of Enoch to explore life in this ancient city.